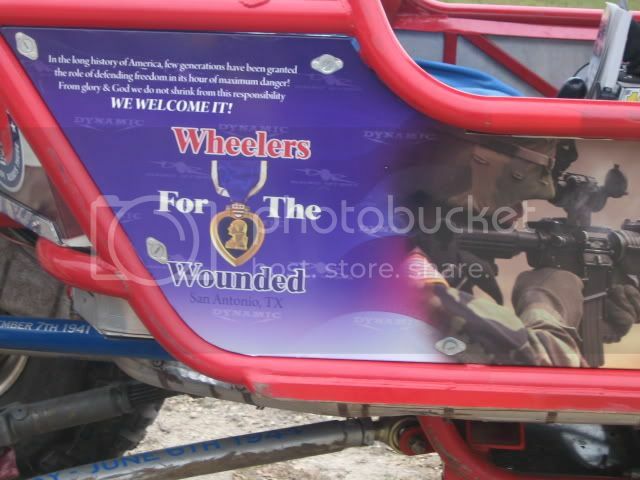 "Wheelers for the Wounded (WFTW) is an organization with the primary mission of providing a weekend of off-roading, camping, and in some cases fishing, to our country's wounded military members all over the United States. This will provide them with much deserved fun and excitement as they traverse the most extreme terrain our great country has to offer in a variety of the best off-road capable vehicles ever built. On the weekend of April 4-5, 2009, the WFTW program began in Florida. From there, off-road clubs all across the United States will be hosting WFTW events in their areas. 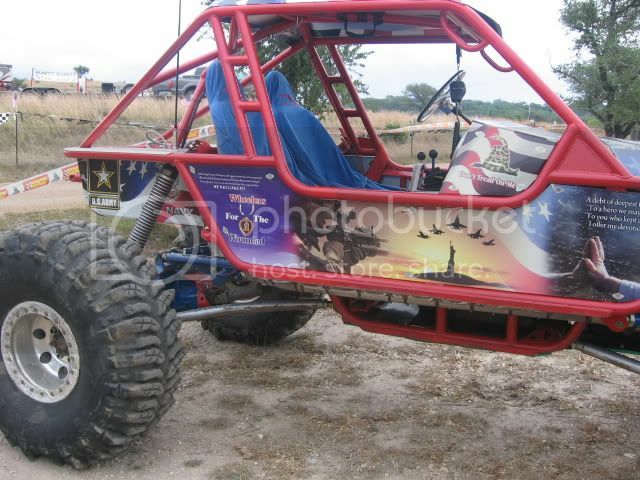 Riding with the groups will give the wounded service members an opportunity to ride along in a variety of modified off-road vehicles, which will surely bring smiles to the faces of our esteemed passengers. At nightfall, they will camp out in the most beautiful parks and forests in the country. The secondary mission of the WFTW program is to increase awareness about our country's men and women in uniform in the hope others will do something nice for our service members." The San Antonio, Texas, chapter was one of the first groups to organize and hold one of the biggest events in the US. 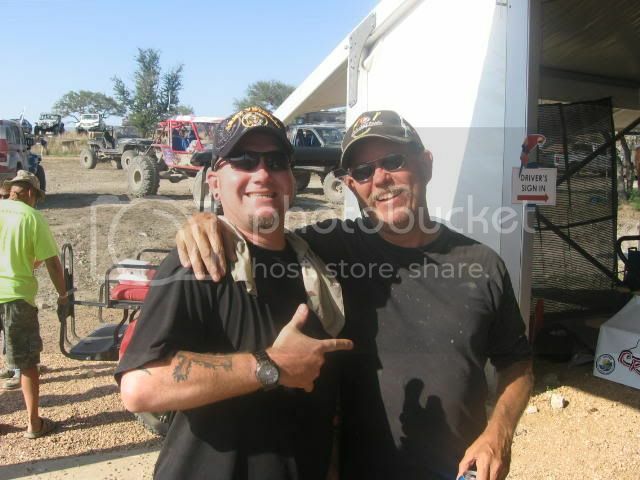 The primary host club is called Midnight Four Wheelers and these folks work their tails off every year as well as many other offroad groups and clubs. Being involved in this is a life changing experience....at least it is for me. There has never been a greater need. It is heartbreaking to see the pain and concern in these young folks eyes. Their future is sometimes clouded and uncertain. Our focus is to just give back and allow them some down time from rehab, hospitals, pain and to have some enjoyable time with their families. 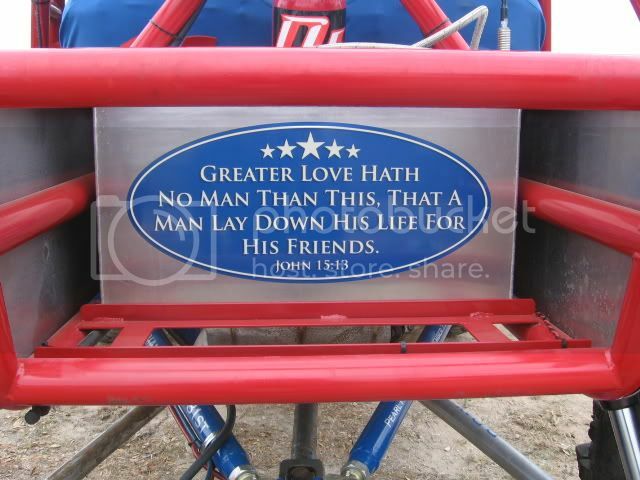 We are just a bunch of redneck Texan's with broken down Jeeps and trucks but, we are doing the things we can to help. Us unloadin a bus and putting these guys in the Action Trac Chairs. She is missing her left leg.....he is missing his right leg. They met in rehab and married soon after this photo. She joked that they only shop for one pair of shoes all the time....just have trouble agreeing on the style. Last edited by Blue Angel on Fri Nov 02, 2012, edited 1 time in total. These pictures are really heart warming! Decoy12 wrote: These pictures are really heart warming! Thanks man! I just wanted to make sure everyone knew where all the donations are going. It just blows me away how generous everyone has been. Before moving to PA I lived in Mass and wheeled with a few groups who belonged to the North East Association of 4-wheel Drive clubs. 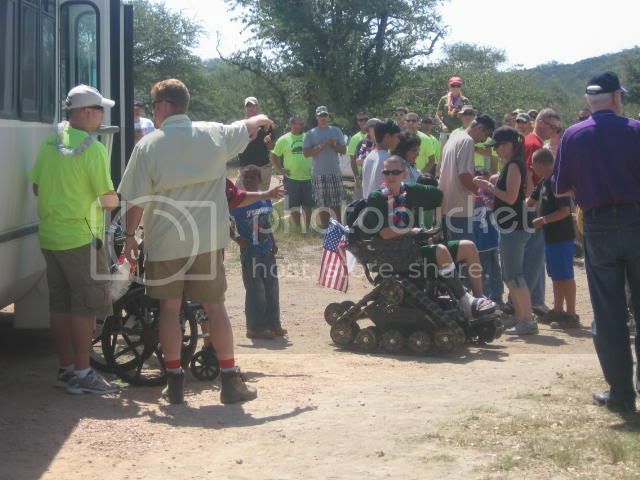 They participated in a few WFTW events and it was great to see veterans who couldn't hike into the woods hitch a ride that allowed them to go places they could no longer walk to. Awesome events, great people and I'm glad our group here steps up to help out. It really breaks my heart when you see just how young these people are. Excellent work you are doing. Thanks guys! Appreciate the comments! Hey blue angel, as a newer member I knew a little of the organization, but these pictures along with your captions make this very real for me. Thank you. I missed out on sending SA some silver for his work on this endeavor. I will figure out how to mail to him this week (I've always bought but never shipped/sold). I have contributed to charities in my lifetime but always favored grass roots efforts as they somehow do a much more efficient job than the larger organizations. Cheers to you and your cohorts for what you are doing! This is a great organization and proud to support it! Thanks to all that you and others members do! Thanks folks! Again, I am offering an official invitation to everyone to come to the event if you want to. There are very nice motels in town, the cleanest and nicest campgrounds I have ever seen, full RV hook up parks, clean restrooms and showers. Austin has an international airport and is only 45 minutes away from Marble Falls. It would be the coolest thing to greet a group of bullionstackers there. 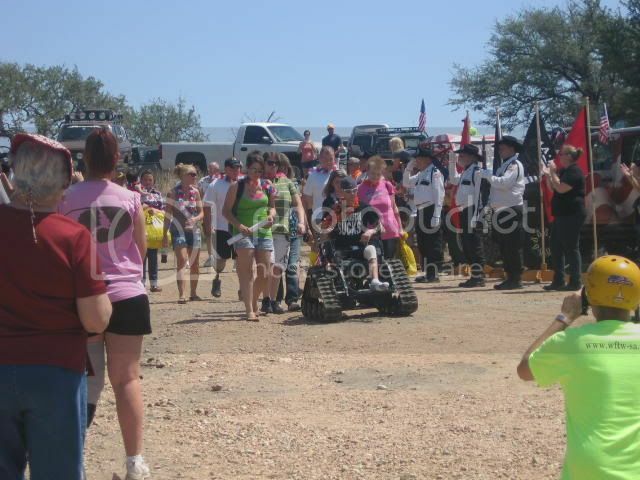 You might notice the way we greet the bus loads of wounded. There is a line of folks on both sides about 200 feet long cheering and making them welcome. There is a huge meal catered with music, a kids zone, and lots of wheeling. Last edited by Blue Angel on Sat Nov 03, 2012, edited 1 time in total. Blue Angel wrote: Thanks folks! I'd say the biggest thanks go to you Jim, for introducing us to this wonderful charity. Indeed, thank you Jim, and WFTW. I'm very proud to have my small part in this, and it always warms me up to see how you guys give back. I do too Jim. I think of him often. Wish we could find him again. That was the most fun I have had. It was a great event. Blue Angel wrote: She is missing her left leg.....he is missing his right leg. They met in rehab and married soon after this photo. She joked that they only shop for one pair of shoes all the time....just have trouble agreeing on the style. They came to two events. The first event they were fresh back with fresh wrappings and no prosthetic. The next year they had been fitted for Prosthesis and were moving around quite well. The first year, neither wanted to be there. You tell they really just wanted to get away from rehab but did not feel comfortable with the NEW them. The Second year, you could not hold them down. I mentioned this to her and she said their outlook changed after the first event. She felt more confident and was amazed at how she forgot about her troubles at the event. We do not always get to hear stories like this, but knowing it happens, knowing that it does make a difference, make it so worth it. blackkramer wrote: It really breaks my heart when you see just how young these people are. Excellent work you are doing. We have had multiple amputees at the event as young as 20. Most are of our fighting men and women are under the age of 35. What amazes me is, we have been in this now for 11 years. At age 20, wartime is almost all they have seen in their life. They were 9 when we started the war on terror. Barely old enough to understand way. Yet, they have taken a oath few will take. They are my heroes. I wish I could express how much support Bullion Stacker has been. You guys stepping up and giving has made this event bigger and better. I am so grateful at the work you have done and the efforts you guys are helping with. You guys are the best. Appreciate you posting up Dan. These folks here at bullionstacker want and deserve to hear all about WFTW. I like to give a big thanks to all those that donated silver, bid on, and/or won the 1oz WFTW Hex bars. If you add in the other various WFTW auctions hosted by myself and others, i think we are well above $1700 donation from this months KSA. Pretty impressive if you ask me. Silver Addict wrote: I like to give a big thanks to all those that donated silver, bid on, and/or won the 1oz WFTW Hex bars. Have any left? Stupid working late on a Monday . . . .